Today we are going to talk about staging your wedding cake. Too often I turn up to the venue with the cake, to find the cake table tucked int a dark corner, which is a shame. After all you’ve paid good money for your wedding cake, and we have worked hard making it for you, so you want to show it off. So where should your cake be set up? Firstly not in a window! Think glasshouses, and sun through windows. It can get very hot, and cakes are made of lots of things that want to melt given half the chance. Moving the cake to a window for photos is fine, but don’t leave it there all day, especially in the height of summer. And in winter avoid radiators or heaters. I set a cake up in a barn once and found a portable heater had been placed right under where the cake was going. Needless to say I had that moved quick smart! Which brings me to marquees. They make my heart sink, I’m not going to lie. I’ve mentioned this before, but it’s worth saying again. I have had cakes literally melt in a marquee, and it’s very frustrating. Marquess get very hot and stuffy, especially the ones with the plastic windows. Again it’s best not to set the cake up by these windows. In fact it’s best, in a marquee, to set the cake up near to the ‘doors’ so there’s some air flow. Last summer I had a couple order a semi-naked cake with a white chocolate drip, and when I asked they said it was going into the marquee. I came out in a cold sweat! It was the start of last years heatwave, and I knew there was no way the cake was going to survive the day. So, I explained to the bride and she arranged for the marquee company to provide a large fan and a mobile Aircon unit to set up by the cake table, which they also placed by the opening to allow the breeze (such as there was.) Because of this all was fine. So it’s worth that small, extra investment to make sure your wedding cake survives the day. Another thing to think about when staging the cake is the photos. The dark corner isn’t going to look great in the cake cutting pics. Plus if the table is pushed against a wall are you going to be able to get proper access to it to be able to cut it and everyone be able to see? 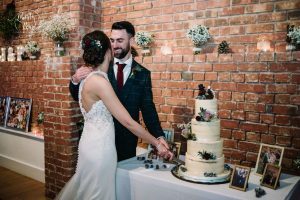 Allowing some space all around the cake table will mean your photographer can move you around into just the right position to get the best photos. And your guests will get the best view of you cutting the cake. After all that is a big part of the day! The wedding cake should be a centre piece and a showstopper. It should be one of the first things your guests see when they walk in. And it’s usually the most photographed thing after the dress. Consider having the cake table next to the top table, then everyone can see it. Now this next tip might seem really obvious, but it’s been an issue a couple of times. Make sure the cake table is level. I turned up to one venue and the cake table was literally wobbling! There was no way I could risk setting the cake up on it. So I had to find someone to go and fetch me a replacement. Another time I had to pack kitchen paper under one side of the cake board in order to level the cake, as the table was on a slope. Although it wasn’t much, by the time the four-tier cake was set up on it, it became really obvious. I always use a spirit level on my cakes (yes really) so I knew it wasn’t the cake. I put the spirit level on the table and realised the problem. Now I do that first, before I set the cake up, just in case. This problem has also happened with log slice cake stands where they are DIY ones. If you’re going to cut your own log slice please level it up. Talking of the table, think about dressing it. Having a nice table cloth is great, but there’s lots more you can do to dress your wedding cake table. Of course the cake should still be the star of the show, but why not have other things on the table as well? Recently I set a wedding cake up and on the table were a selection of family wedding photos, which was such a lovely touch. 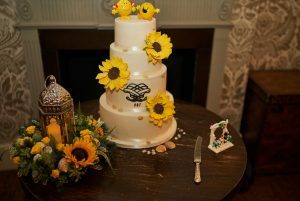 Some brides leave space beside the cake to set their bouquet down and display it, this also looks pretty for the photos. Now to cake stands. The first thing I advise is always to ask your venue if they have cake stands you can use, many do. But do you actually need one? With the trend towards double height tiers and tall cakes, you may find you don’t really need a stand as well. But if you do then there are a few tips. Make sure it’s big enough. Again this might seem obvious, but I have been presented with cake stands that my clients have bought and they have been too small. The stand needs to be at least the same diameter as the cake board, to allow proper weight distribution and stability. With this in mind avoid the cheap, flimsy stands that may not take the weight. Check the stand foot has a fairly wide base too, this will also avoid instability. As will avoiding very tall stands. They look great, but can mean one knock to the table and disaster!! Avoid stands with lips. The cake stand should be flat. If you are at all unsure then ask your cake maker if they have stands they can hire to you, although there will be a charge and you’ll have to return it. So to round up, here are your top tips for setting up and staging your cake. 1/ No direct sun or heat source. Cakes are made out of lots of things that want to melt. 2/ Make sure the table is level. And the log slice if you’re using one of those. 3/ If having a marquee then consider hiring fans or air conditioning. 4/ Think about the cake cutting photos and having enough space to get them right. 5/ Before ordering a cake stand ask your cake maker for the dimensions of the cake board so your stand is big enough. Your venue might have stands or your cake maker might hire them.